The Calum Maclean Project is based at the department of Celtic and Scottish Studies, University of Edinburgh and focuses upon the collected archive materials of the renowned folklorist and ethnologist Calum I. Maclean (1915-1960). For further details, please visit the project website. The actual project website is at this link. There are a few gems of stories to be found as you look around and there was one on the Loch Ness Monster or Uile-bhèist Loch Nis that caught my attention. The story was told to Calum MacLean by William MacKenzie in 1952. MacKenzie was a retired gamekeeper, aged 80, residing in Cannich, Strathglass. It’s true and I believe in it. I heard it from my father and mother, and they were very old, that the old folk saw it there. I heard from one old man who stayed near there. He was working at something or another. I think that he was digging or something on his croft in the red earth. And his feet were very dirty because of the earth. He went down to the lochside to clean his feet by the lochside. And this wild beast appeared, it came to land near to him. He scarpered and left his shoes behind by the lochside. A few folk mocked him but he was a good enough [i.e.honest] character. There are folk who have seen it long ago and they would tell stories about it. There is absolutely no doubt that it [the monster] exists. The rest of the blog article suggests this story happened no later than 1880. I was wondering if it was the 1871 hump sighting by a similarly named D. MacKenzie, but it does not appear to be the same account as we are told this one involved a head and neck rearing up twenty yards from him. This sound very like the previous article on John MacLean which also involved a head and neck report at about 20 yards distance. The list of sightings I have perused suggests it is a new story which I now add to the roster of claimed sightings of the Loch Ness Monster. However, I am open to suggestions as to possible known parallels. One other tale that caught my attention was the legendary Beast of Barrisdale. You can read about it here and here. This is (or was) a beast alleged to live around the hills of Loch Hourn, which was more heard than seen as its blood curdling roar echoed through the region. About the size of a donkey but with a mane and a tale like a horse. The head was broad at the top like that of a wild boar but there was no snout. It was a heavy over-hanging jaw and terribly, terribly ugly. As I read these tales, I was reminded of a story by Tim Dinsdale which was retold in an article here. 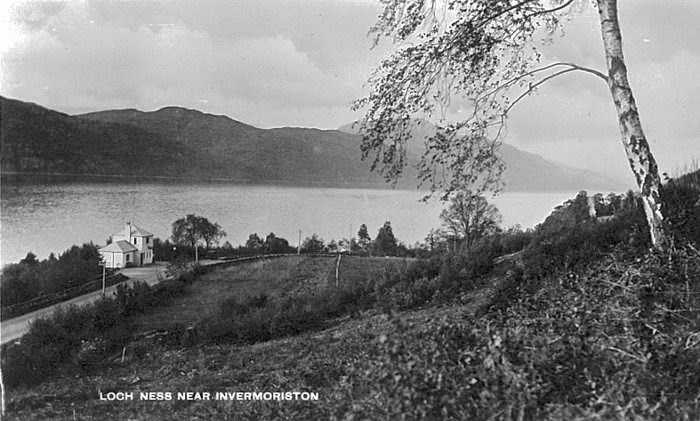 It related how Tim further was in his boat at Loch Morar when he heard a blood curdling scream echo across the loch as he sought a safe haven during a storm at 3 o'clock in the morning. Loch Morar is only a few miles south of this reputed region of the Barrisdale Beast. That made me wonder whether Dinsdale had heard this strange beast. Then again, the last report of the beast was seventy years before Tim's story. Then again, perhaps it was just a Banshee! One final story which has always intrigued me from near Loch Ness was the so called miraculous footprints of Finlay Munro. This is a set of footprints just down the road from Invermoriston which reputedly appeared after a preacher by that name left them as a sign against some hecklers. Apparently, the prints are still there, despite being stolen and returned. Perhaps I will yet get to visit these legendary footprints as I visit Loch Ness on my next trip. Perhaps it is long overdue, but I finally come to one of the classic sightings of the Loch Ness Monster. It occurred on the 28th June 1938 near the Alltsigh Burn where John MacLean witnessed what he called an "extraordinary sight" less than twenty yards from him. Back in those days, fevered talk of a large monster in Loch Ness had largely calmed down. Whereas 1934 had produced over one hundred reports, the year of 1938 gave us a couple of dozen, with some of those not coming to light until years later. The following year would see reporting cut short by the war, so this story proved to be one of the best before Nessie reporting went into abeyance for years. The story was picked up by several newspapers. For your reference, the account appeared in The Scotsman and the Aberdeen Press and Journal on the 30th June, the Inverness Courier on the 1st July and the Northern Chronicle on the 6th July. The clipping below is from the Press and Journal. A Glenurquhart man, Mr John McLean, had a close view of the Loch Ness monster about a quarter-past nine o'clock on Tuesday night. He was standing at the shore near the mouth of the Altsigh Burn watching whether any trout were rising, as he thought of going fishing, when he saw what he describes as "an extraordinary sight." "It was the monster's head and neck less than twenty yards from me." he said, "and it was, without any doubt, in the act of swallowing food. It opened and closed its mouth several times quite quickly, and then kept tossing its head backwards in exactly the same manner as a cormorant does after it has devoured a fish." What the monster had eaten, Mr McLean could not say, but he thought a trout of from one to two pounds in weight would be as much as it could manage at a time. He also said that at that particular spot the water teems with excellent trout. No sooner had the creature finished its meal than it dived below, but before doing so two distinct humps and the entire length of the tail came to the surface. The monster then vanished head first. but came up again a few yards further west, and there it lay for two or three minutes on the top of the water. The tail was again quite clear at the surface, with the head, neck, and two humps showing. In a moment or two it began to dive very slowly and, in doing so, the head was submerged first, followed by the humps, but at this point the foremost hump became very much larger and rose in fact almost twice as high out of the water as it had been at any time during its appearance. Summing up his description of the creature, Mr Maclean said: "1 was absolutely petrified with astonishment, and if I did have a camera with me I was so excited that I would probably have spoiled the chance of a lifetime. "The monster, I am sure, is eighteen to twenty-two feet long, the tail fully six feet, and the largest hump was about three feet high. The head is small and pointed, the skin very dark brown on the back, and like that of a horse when wet and glistening. The neck is rather thin and several feet long, but I saw no flippers or fins." This, it may be added, is the first time that anyone has seen the monster full length above water or out of it, and the entire tail, which was about a foot thick at the root and tapered to a fine point. I have read all these contemporary accounts which were published within days of the event and they are all almost in perfect agreement as to the details of the sighting. Clearly, it is important to record the witness' words before the memory of the event fades. Although, it has to be said that an event of this magnitude is more indelibly left in the mind of the observer. The map below gives the location of the sighting at a place halfway between Invermoriston and Foyers. The Alltsigh Burn is visible and runs into Loch Ness. As you can see from the Google StreetView, the stream is visible from the road as it runs into the loch. The Halfway House Tea Room was situated near the stream in those days, but later came into the ownership of the Scottish Youth Hostel Association which runs it today. A number of good sightings of the creature have been made from this establishment over the years. However, it is not clear what Mr MacLean's connection to the restaurant was, whether it be customer or staff. You can see it in this postcard produced in the mid-1930s. Such was the interest in this story that the Scotsman ran a second article on the 1st July with sketches of the creature made under John MacLean's direction (or drawn by him). This was not the end of John MacLean being interviewed as Nessie researcher, F.W. Holiday, tracked him down years later at his home in Inverness. The interview was recorded perhaps in the summer or autumn of 1963, so about 25 years after the event. The interview is reproduced here below. INTERVIEWER: Could you tell me what you were doing at the time when you had your sighting? JOHN MCLEAN: Well, I was just about to start fishing, you know, at the mouth of Altsigh Burn, when I saw this creature appear. I.: What did you see first? J. m.: The head and neck. It came right above the water. The neck would be over two feet long. I.: How thick would the neck be? J. m.: More than that. J. m.: Yes, about that ... and not a very big head, you know. The size of a sheep's head. I.: Is that what it reminded you of? J. m.: Yes . . . if the ears and that were taken off. At the time I saw him he was champing away at something. I.: You saw his mouth opening and closing, did you? J. m.: Yes . . . as if he was eating something, you know. I.: Did you see any sign of teeth? J. m.: No, I didn't notice. No. I.: Any sign of a tongue? J. m.: No, I didn't. I was alarmed, you know, at what it was. I thought at first it was an otter or a seal or something and then I knew perfectly well it wasn't that. So . . . he was like that for about two minutes and then he gradually put his head down and the hump came up — one hump — and then the tail . . . a long tail about six feet long . . . a longish tail, anyway. I.: What did the skin look like? J. m.: Well, I'll tell you. The second time I saw him, he rose in the bay further up, the whole length of him, and when he dived that time I saw the two humps. The skin was for all the world like a horse that's been well-groomed and polished, you know. J. M.: Yes, sleek — like that, you know. It was dark but the bottom part of the hump was more a straw colour. I.: It's got a pale belly on it? I.: You didn't see flippers? I.: Did you see any sign of eyes? J. m.: Oh, yes there was . . . two small eyes. I.: Whereabouts were they? On the side of the head or on top of the head or . . . ? J. M.: More or less on the front, really. I.: Do you remember what shape they were? Round or . . . ? J. m.: They weren't round. They were more longish. Oval-shaped. I.: And how long did you have him in view would you say? J. m.: The first time about three minutes or so. The second time about the same. But the second time, when he rose in the bay further up, the whole length of him was on the water. I.: Now then — how long would you say he was? J. m.: Oh, he was about thirty feet. Yes he was. I compared him with a boat, you see, at the time. I.: You couldn't guess his weight, I suppose. Heavy? J. m.: Oh, he must have been. That hump when he went down the second time . . . it was massive, you know. It was big. It would be three feet above the water. You could see that there was something pulling him . . . something pulling. . . . I.: Where was this pulling action? J. m.: His whole body seemed to go. The whole thing seemed to go. Just for all the world like a snake. I.: Did you feel afraid of it? J. M.: Well, to tell you the plain truth, I didn't know what I was. I thought it's neither a seal nor an otter. It never dawned on me at first about it being a monster or I'd have run up to the Half-way House and got a camera and took a snap. I.: What year was this? J. m.: Back in nineteen thirty-seven. I made a sketch of what I saw in the Daily Record of that time. You could see the three phases I saw of it — the head, then the diving and the tail, then the body. It is interesting to note that the passage of time has seen some details added and altered, hence the reason one would give preference to the accounts given two days rather than two decades later. For example, Mr. MacLean tells Holiday he reckoned the length was thirty feet whereas twenty feet was the estimated length in 1938. Likewise, he incorrectly states the year as 1937. However, the account is largely consistent with what had gone before. Some details are added such as the neck dimensions, which look consistent with the drawings made at the time. Also, Mr. MacLean adds that the creature had a paler underside, which is again consistent with the shadings made in the drawings. There is also the matter of eyes. Again, not mentioned in the original accounts, but now described as long, small, oval and to the "front" (as opposed to the side or top). The drawing appears to give the impression of a lighter patch on the top of the head which suggests an eye, but I am not sure I would say this was at the "front". John MacLean was quite sure that if he did have a camera, he would have been so excited that he would probably have "spoiled the chance of a lifetime". Perhaps he would succumbed to a bit of that old "shock and awe" and made a hash of it. Then again, perhaps he wouldn't have, we'll never know. But, as an experiment, I constructed an object of similar dimensions and placed it 18 metres from myself one hour before sunset (quarter past nine was about an hour before sunset on the 28th June 1938). To the naked eye, the object was easily discerned and I took two pictures below. The first with a digital SLR and the second with the ubiquitous mobile phone camera. The approximate sun location was pretty much the same which may have put the object in the shade, though that created no problem for my view of the object. The solar azimuth calculation below puts the sun to the rear or right of the observer (depending on his position, sun at yellow line, sunset is red line). So, a "monster" appears 18 metres from the observer and even at that distance, the mobile phone produces an image which sceptics will take delight in quibbling over and putting down. The SLR is obviously much better but it cannot make out the lettering on the top object, which suggests verifying features such as eyes would not be a simple task even at 20 yards. Sightings of this kind from 50 yards down are exceedingly rare. We have the better known ones such Greta Finlay and Patricia Harvey but the total runs at about 35 accounts or about 2% of the total database or one every 2.3 years on average (with this being skewed towards the 1930s). At least three of these have produced photographs (about 9%), of which the most famous is the Cockrell picture. Evidently, producing pictures even at these close ranges is not a guarantee that a game changing picture will be obtained! The test pictures I took seem to bear this out. But what was it that John MacLean saw on that summer day over 76 years ago? It is my opinion that MacLean saw the Loch Ness Monster. It was a clear, unambiguous, close up view of the beast from less than sixty feet away and indicated features not consistent with known creatures. Of course, it would be simple to dismiss MacLean's account as a hoax. Indeed, he had another sighting only months later which always raises a red flag with sceptics (they don't think people should see Nessie more than once). That account happened on the 22nd September and was printed the following day in the Scotsman (see below). This was certainly a lower grade sighting compared to his experience in June as it was about a mile away and lower in the water. Although binoculars were employed, this kind of sighting gravitates more to the "inconclusive" category. I would take the view that if John MacLean was a hoaxer, then we would have expected him to have produced a better sequel than this to his first story! Now, we are told that since this report is "anecdotal", it is not scientifically testable and therefore not suitable as data. However, that does not mean it is a false account (which some seem to infer from this). Rather, the correct position to take is that a scientific approach cannot tell us whether this is a true or a false account. However, since some have come to the conclusion that the Loch Ness Monster as a novel species is an untenable theory, the "anecdote" must of necessity be false. The problem is that the creature described in the account bears little resemblance to anything in the locality. How can a sceptic approach this type of account without any credence being given to unknown creatures in Loch Ness? Simple, you change the description of the creature seen by claiming the witness mis-saw or mis-remembered the object. Brilliant, simple and unscientific. This device is widely used by sceptics to debunk close up sightings such as this one by John MacLean. It is brought in under the pretence of finding the "simpler explanation", yet it is disingenuous to apply this technique the way it is as it is untestable and unfalsifiable. If a technique is untestable and unfalsifiable, it is not a simpler explanation because there is no way of knowing whether it is in fact the correct explanation. In this light, it is more than likely that some will claim that John MacLean simply mistook a seal for a monster. As a comparison, here are some seal shots. There are some obstacles that have to be overcome when debunkers try to dilute the force of a witness' account. Here is the list of differences between the observed creature and a seal. 1. Seals are not twenty feet long. 2. Seals do not display the kind of head and neck described by the witness. 3. Seals do not display two humps. 4. Seals do not display their entire back contour from tail tip to head above water. 5. Seals cannot expand their back in the manner described. 6. Seals do not possess a tail of the length described. 7. No whiskers were described on the creature (unlike seals). This doesn't include other "minor" problems such as whether a seal was actually in Loch Ness at the time. John MacLean is recorded as saying that he thought at first it was an otter or a seal or something but then knew perfectly well it wasn't either of them. Well, it seems the sceptics know better and will insist he is wrong for no other reason that witnesses are never right about these things. They must always have either mis-saw and/or mis-remembered what they claim. There is no Loch Ness Monster, therefore no exceptions, no concessions, no such thing as a reliable witness. I won't go into the suggestions that MacLean failed to recognise a cormorant or an otter for what they were. Quite simply, there is a limit to this theory of misperception and it grinds to a halt long before it reaches this sighting. No ground can be given, for if it is admitted that one sighting could be a genuine "monster", that casts doubt upon other sceptical interpretations. Researchers such as myself have no trouble admitting a percentage of reports are misperceptions or hoaxes, but it is rare to see a sceptic admit that even one of the thousand plus reports is inexplicable and could have been of an unknown creature. So the problem is that the misperception theory is not a scientific theory. It is a theory, but not a scientific one. Why not? Because it cannot be properly tested. Normally, when a theory is proposed to explain something, an experiment is devised to test the validity of the theory. Attempts have been made to do this by setting up bobbing poles in the loch and gauging people's reactions. The problem is the results are not that great and we have the problem of artificiality where people suspect they are guinea pigs and give a reaction that may or may not be similar to an unforced situation. Because of this, sceptics turn to general experiments on perception and try to force them into a Nessie shaped hole. Again, that is not a scientific approach. You have to devise experiments that are tailored to the subject in question to focus on its unique characteristics. To repeat, a theory that cannot be properly tested is not a scientific theory. Equally, if not more problematic is the unfalsifiability of this misperception theory. By that we mean, is there a situation which can arise which proves the theory false? If not, then the theory is scientifically useless as it will always predict the same outcome no matter what. Let me show this by example. Suppose a 30 foot creature did really get into Loch Ness and showed itself at 50 metres to various witnesses. The witnesses give an accurate description of what they saw and the "experts" assess the testimonies. They then conclude the witnesses saw two seals swimming in line. You see the problem? Even if a real event happened, it is easy for the misperception theory to produce an explanation. This is because the explanation comes at no cost and is unverifiable. That does not mean that the misperception theory cannot be employed, it can be if used in conjunction with corroborating evidence. The problem is it is overused to the point of simply going through the motions and glibly ticking off seal, log, duck, boat or otter from a checklist without any recourse to testing. The use of it has become lazy and unintellectual. I think the point is that sceptics are employing a degree of trust or "faith" in this theory more than they are willing to admit. Having accused "believers" of being faith-like in their approach to the subject, it would hardly do to admit there is a degree of faith in their own theories! But supposing one goes out on a limb and takes the outrageous position that John MacLean reliably described what he saw? Now there's a novel position, a reliable witness! If so, the theme of a large, unknown creature in Loch Ness continues. John MacLean did see something "astounding" in the loch that day and people such as myself have speculated on what that might imply ever since. Quite simply, do not give in to these people who insist these accounts are somehow false and untrue. As I looked at the past literature, it was a mixed selection. I have already mentioned Holiday and his visit to John MacLean. We also have the sighting mentioned in Nicholas Witchell's "The Loch Ness Story" and Peter Costello's "In Search Of Lake Monsters". The latter draws upon Holiday's interview as well as earlier accounts. Roy Mackal also uses it in his list of best sightings in "The Monsters Of Loch Ness". However, other authors such as Whyte and Dinsdale do not mention the sighting. Those that did, do not really go into much interpretation or discussion. I find that a bit disappointing as sightings as close as this one are more likely to deliver key information on the creature than ones reported from ten times further away. As an aside, sceptical books also do not really engage with the story. Only Steuart Campbell in his book, "The Loch Ness Monster - The Evidence", mentions it in any detail and he implies that John MacLean only saw an otter (despite MacLean saying he did not). 1. Some "head" sightings are misidentifications and hence distort the database. 2. Some "head" sightings are hoaxes and hence distort the database. 3. Genuine head sightings are poorly described due to distance, time and obscuration factors. 4. Genuine head sightings are seen from different aspects (front,back,side) but assumed to be another aspect. 5. Genuine head sightings are accurate but are different aspects of the creature's gender, age, etc. That may not completely harmonise matters as some subsets of LNM sightings are odd to say the least. There is the matter of the pole like structures sometimes reported, but I feel that is an article in its own right. The most bizarre feature of this testimony is the hump expanding in some curious way before the creature finally submerged. We read that the foremost hump doubles in size as the object slowly submerged. Prior to this, the creature, in an almost equally bizarre manner, lay on the surface for several minutes. Critics of reports like this try to deflect by stating this type of behaviour is at worst impossible or at best unheard of. They attempt to achieve this by framing the Loch Ness Monster as a simple creature with little in the way of novel behaviour. The actual lesson of Loch Ness Monster research is not to make the beast too simple, but neither make it too complex. In my opinion, and that of monster researchers of times past, the creature possesses organs capable of quite notable positive buoyancy. This seems to be achieved via sacs or something similar that line its back and possibly sides. The action of these sacs is believed to be observed when the creature has been seen on multiple occasions changing its back contours. Of course, we have various examples of creatures with inflatable air sacs. In fact, to see an example of positive buoyancy "in extremis", watch the YouTube clip below. You could say our pufferfish puts the alleged extreme buoyancy of the Loch Ness Monster to shame! Clearly, the pufferfish employed its inflation ability as a defence mechanism. Why the Loch Ness Monster does this is not as clear. The creature starts off in this non-inflation mode as its neck juts out of the water. The depth at 18 metres out is less than 70 feet and one assumes the LNM is at near neutral buoyancy. Once it moves further out, positive buoyancy kicks in while it appears to do nothing at all after its presumed meal. Then we have this extraordinary ballooning effect of the foremost hump. A strange thing to observe if this was only a seal, otter or cormorant! I feel we have some kind of clue here but the final hump action is initially counter-intuitive. If the creature is submerging, it must go from positive to negative buoyancy and the description of the beast acting as if it is was being "pulled" into the water suggests a rapid change in buoyancy. The natural assumption to make is that the hump would deflate to effect this transition as if air was being expelled. In fact, the opposite appears to happen! However, it may be that the swelling of the hump is not due to an intake of air but rather water from the loch. Certainly, the aforementioned pufferfish can take in water or air to inflate itself. That would certainly make the creature heavier, but would it make it denser than if the hump was fully deflated? Perhaps a rapid water intake does aid a rapid dive, but since this behaviour is rarely (if ever) seen in other accounts of the creature sinking, it does not appear to be a necessity to normal submergence. This blog accepts that John MacLean had one of the closest encounters with the Loch Ness Monster on record. Witnesses are more reliable and accurate than sceptics claim and no one who believes in a Loch Ness Monster should allow this to be so easily taken away. Certainly, at about sixty feet away, any debunking involving seals, otters or cormorants requires more than just saying so. Of course, it is possible that John MacLean lied about his account. If anyone has evidence to that effect, let them bring it forward. Any suggestion that he lied because there is no Loch Ness Monster is circular reasoning. As it turns out, Whyte and Dinsdale do mention the MacLean sighting favourably. This is an occasional problem is doing index based research, as your subject may not always appear in the index. Constance Whyte mentions the sighting in her "Appendix A" of additional reports while Tim Dinsdale mentions it anonymously in his "Jigsaw Puzzle" chapter when tail sightings are analysed. It is clear from one of the descriptions that he is referring to J. MacLean. One well known sceptical researcher took my initial statement on the Whyte/Dinsdale silence to be negative on MacLean (as if these authors "knew" something about him and quietly dropped it). Unfortunately (for him), he was wrong.